Perhaps no player increased their stock as much as McFarland at the NHL draft scouting combine. McFarland is definitely an enigma and perhaps the biggest boom or bust prospect that will be drafted in the first round; that is, if you take out the Russian Roulette Factor. The fact that McFarland is on e of the best skaters in the entire draft and has insane offensive potential, along with his scouting combine performance might attempt more than one NHL GM and scouting team to take a chance on him earlier than I rank him (19th). By the same token, given his less than stellar OHL season, he likely slips to the bottom third of the first round. 2009-10: In his second season in the OHL, McFarland finished second in team scoring for the Sudbury Wolves, registering 50 points (20G – 30A) in 64 games. Scouting Combine Performance: McFarland had simply an amazing combine. During his rookie season in the OHL, McFarland competed for Team Ontario in the 2009 World U-17 Hockey Challenge on Vancouver Island. He was the tournament scoring leader, with a total of 12 points, and was also on the tournament all-star team. He captained Canada’s Under-18 team to gold at the 2009 Memorial of Ivan Hlinka tournament. McFarland has represented Canada in each of the last two WJC-U18s. 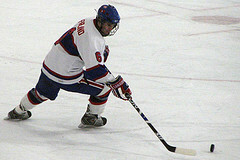 In 2009 he finished second on the team in points (3-5-8) and in 2010 he tied for the team lead in goals with 4 tallies. Continue to train to increase strength and mass. Prove he has the necessary drive necessary to make it at the next level.